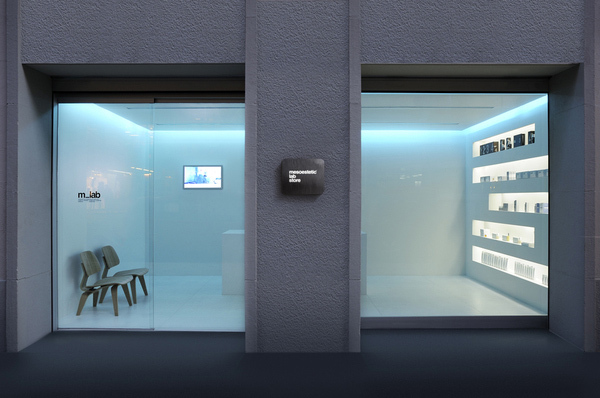 The Spanish design firm Espluga + Associates, based in Barcelona, is one of those companies that does it all: graphic design, branding, advertising, naming, and, as they say on their website, lots of other things that end in ‘ing’. One of their recent projects involved several of these capabilities rolled into one. 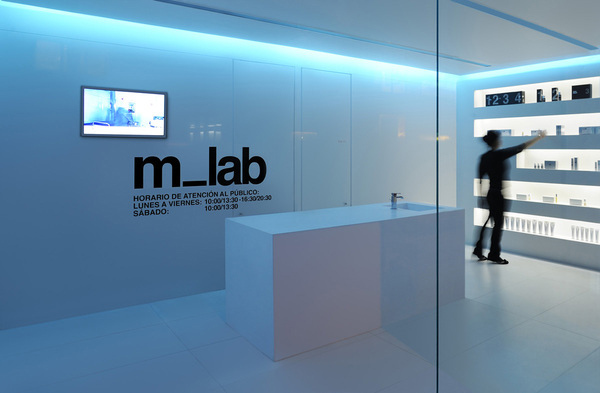 m_lab, Mesoestetic’s ( a company/laboratory specializing in the development of products for the treatment and care of skin) first lab store in Europe, includes interior design, naming, visual id, and packaging by Espluga + Associates. The white, minimalist design with its recessed blue-tinted lighting along with the Helvetica-driven signage and packaging creates the perfect cool and sterile lab-like feel. Nice! You can see more of Espluga + Associates work here. And stay tuned for our next post on a completely different project by this talented studio. This entry was posted in Architecture, Graphic Design, Stuff We Like, Typography. Bookmark the permalink.